I'll start part 2 (part 1 is HERE) by describing what TTL actually is. Feel free to skip this part if you already know this. Back in the good old film days a lot of flash guns had a small calculator in the form of a chart or a small disk that rotated. These things basically calculated what setting worked for the Guide Number of the flash you were using. I had a Vivitar 283 back in the early 80's, which was one of the most popular and reliable guns of it's time. It had a dial built into the hinge of the bounce head (photo left). You set the dial to whatever ASA/Din number your film was (now called ISO) and the dial told you what distance you would cover with the varies apertures. The coloured sections corresponded to a dial on the front of the camera. It all goes a bit hazy after that...it was a long time ago. But I do remember having a cable that plugged into the front of the gun to use it off the camera. Fast forward to today and we have much more sophisticated flashes that talk to the camera and vice versa. The camera takes it's exposure reading through the lens (TTL) and tells the flash the information it needs to know. The flash then works out how much power it needs to put out to achieve a good exposure. The flash gun can also let you know via it's display if the right exposure was obtained. What TTL Cable Works With The X Series If you want to do off camera TTL photography with your X Series camera, you will need an EF-42, EF-20 or an EF-X20 and a TTL suitable for a Canon (usually called ETTL in Canon speak). The Canon hotshoe pins match the Fuji ones and allow TTL flash with a Fuji X camera. Nikon has a different pin arrangement and definitely won't work in TTL. Remember to turn off both camera and flash when attaching a TTL cord as the contacts are sliding into position and could short out. I've never been a Canon shooter so I don't have access to their flash guns and I can't say if an X camera and Canon flash can speak to each other and work in TTL harmony. Nikon guns do not work in TTL. Nikon flashguns will work on an X series camera in Manual or Automatic, but not in TTL. If used on an X camera's hotshoe or with a TTL cord, A Nikon flash is only being told by the camera to fire - exposure settings are up to you the photographer. The flash must be set to Manual (not TTL) or it won't fire. The Pixel FC-311/S TTL Flashgun CableCanon's own ETTL cords will be great for the job, but they do tend to be a bit spendy. I bought the Pixel FC-311/S 1.8m cable (for Canon) from Amazon UK for £17 and it works fine. A really nice feature with this cable is that it has both a tripod mount and a cold shoe for attaching it to a light stand. This could come in really handy (although a longer cable might be better for using on a light stand). I'm using an SB700 soft case to hold the Fuji EF-42 and the TTL cable and there's even space for a plastic foot too. Hand Holding For Off Camera Flash Obviously if you are doing off camera flash without the use of a stand or tripod, you have to be careful of camera shake as you'll be holding the camera with one hand. Thankfully X cameras are great for hand holding due to their size, weight and the lack of a mirror popping up and down. But having a good solid grip and steadying technique is very important. In the photo below you will see the grip I use. By holding the flash in the left hand and crossing it over to the right, you can rest the camera on the left shoulder, the flash can be stretched out as far to the right as you like, as long as it's pointing in the right direction a bit of shake won't make any difference. 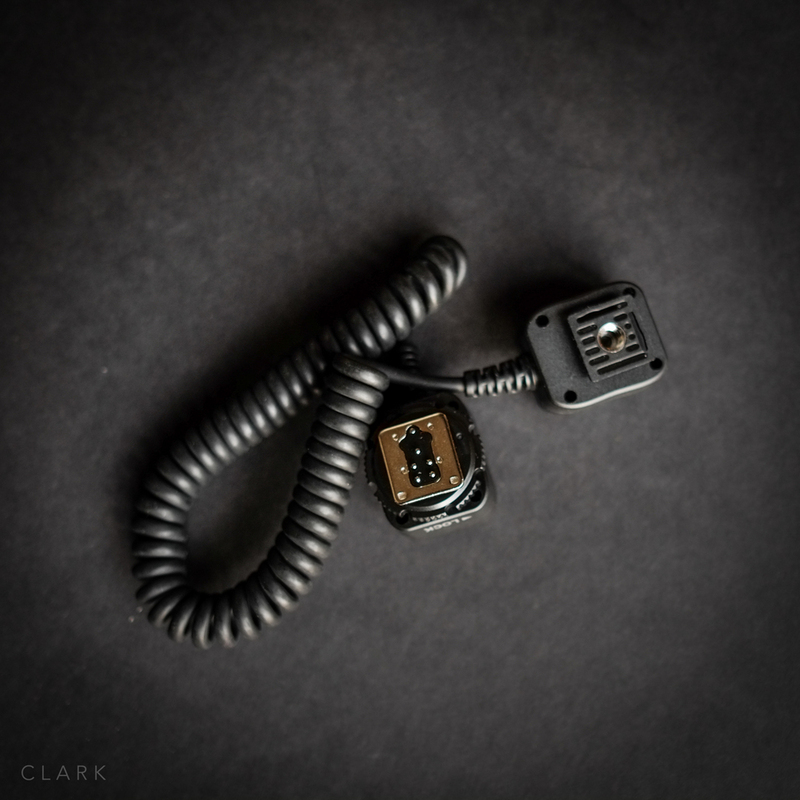 If your TTL cord has a hotshoe or tripod mount at the flash end (Like the Pixel cord), you could easily use a handle. Lastolite do an extending Handle and a Brolly Bracket. So that's off camera TTL, what you do with it after that is up to you. There are some interesting accessories available like the Rogue Flashbenders to spread or direct the light, or Rogue Gridto focus it exactly where you want without light spilling all over the place, which is a must if you have a coloured gel on the background. The possibilities are vast and a lot of fun.